In preparation for the SA Trophy Carp Angling finals that took place in May at Tzaneen Dam, I decided to do a practise session before the annual competition. As always, I was filled with great excitement to this truly majestic location in Limpopo. This province truly got me hooked on big carp angling. I fished oom Cecil Vermeulen’s water on the Groot Letaba River in the past and had a truly memorable session with my dad. We landed plenty fish over the five days, and where else do you get to fish a venue with epic wildlife such as hippos and crocs roaming about. I was totally hooked! I tried to book my favourite swim at Tzaneen but was informed that it was already taken. I panicked as I wasn't familiar with the other spots and contacted Kobus Lottering, the event co-ordinator, who suggested a new swim on the dam. I pestered him regularly to get as much information possible, as I wanted to make the most of my time there; the depth of the waters, where the margins sat, visual features, what spots have produced in the past and of course safety was high on my priority list. I became truly excited once I reviewed all the information oom Kobus was willing to supply and began my preparation in earnest, starting at the business end. The KD rig is my rig of choice, and I constructed ten hooklinks and leadcores each. My hooklinks consist of Kryston 45lb (the best hooklink material in my opinion), a size 2 Ace Razor Point hook and Korda putty. I prefer my hooklinks to be 40cm in length. In the past I've experimented with hooklinks up to 60cm in length and as short as 20cm. Both have worked well, but for me the 40cm hooklink has produced the most fish, and also the least amount of tangles. The 45lb hooklink will allow you to put more pressure on the fish when needed. Once I had my end tackle sorted it was time to pack the trailer! I made sure that I had absolutely everything, from my inflatable down to probably one of the most important things (for me): my pillow. I had prepared my feed a day before departure – consisting of 2kg tiger nuts, 1kg maize and 5kg hemp. One day is just enough time to get the fermentation process going before I arrive at the venue. Gathering information is crucial in my angling. The last thing I had to do was to contact Devin Hansma; he fished this particular swim during the previous year's World Carp Masters. He pointed me to spots that produced for him, and also informed me that the water level was quite low this year at 70 percent. That is not necessarily a bad thing because it concentrates the fish, and it gave me a good idea of what my challenges would be. This particular swim has a large amount of snags to contend with. I prepared by adding 50 to 60m of 40lb Berkeley Big Game mono to my spool. This would give me enough leader even if the fish is fighting me down in 20m of water and has wrapped itself around a snag. I won't get cut off because of mono’s abrasion resistance. I can also grab the leader with my hands if I need to pull the fish out of the snag and using your hands are more direct. My dad and I departed for Tzaneen at 2am on the Friday morning. We left early because my dad had to leave again on Sunday, and he hoped to land a fish or two in the short time he would be joining. We arrived at 6:30am and immediately saw fish showing. We made a mental note of where these fish appeared and soon went out on the boat to investigate. They were surfacing in and around the riverbed, so we marked the area with the GPS. We were eager to get our lines in, and dropped a single line in the riverbed while searching for more basic features in the margins. We then continued to set my dad's rods up first to get him ready for action. He fished four spots, ranging in depth from one to seven metres. Considering that I was going to be here for a week, I decided to spend another three hours on feature finding to make sure I was comfortable with my spots. Oom Ferdie Luyt of MCT Carp Tours and Greg Toplis, two very good friends of mine, also gave me advice on where I should drop my lines. And with that in mind I chose to target the carp 'highway'. I dropped one line (using plain tiger nuts as hookbaits) at about 90-degrees to the bank, going across a steep slope at a depth of three metres. My second line was at a depth of nine metres, again with plain tiger nuts as bottom baits. And lastly my third line was in at a depth of 12 metres with a single plain tiger nut topped with popup maize. Within the first four hours my dad and I had a double-up with each landing a small carp of around 17.5lb (8kg). It was a start – breaking the ice. By Sunday we hadn’t had any more action, and my dad had to leave to go back to work. Oom Ferdie arrived later that day, and we had him set up and fishing in no time. My good friend Greg joined us later that evening, and we had his lines sorted quite quickly also. That night, we enjoyed some delicious KFC that Greg brought us on his way to Tzaneen. Satisfied and tired from the day’s activities, we called it an early night. At about 2am on Monday morning I had a rude awakening from my left-hand rod belting off into the darkness. I grabbed it and felt it was a reasonable size fish. The hippos were doing their rounds, and for safety reasons we couldn't get into the boat. We decided to lock up and pull the fish from the bank. Hippos are incredibly dangerous, and I learned a great lesson fishing oom Cecil's swim when a hippo chased our inflatable (also at around 2am one morning). Since that session I gained a new respect for these truly magnificent yet dangerous animals; we were lucky that it didn't end badly. About five minutes into the battle, I could feel the fish snagging at a tree stump. I walked to the left of the bank in an attempt to free the fish, which I did, and landed a stunning 26lb (11.8kg) common carp. We sacked her until the following morning for photographs before we released her again. As soon as the sun rose, we dropped my line at the same spot with three handfuls of feed. I am not a fan of feeding heavily and prefer to feed a maximum of ten handfuls on each line in the summer, and I use as little as two handfuls in the winter (I use less feed in winter due to their slower metabolism). We immediately felt that something was up with the weather, with Monday approaching 40°C. At about 11:30am my left rod took off like a steam train. This time I couldn't turn the fish, and it felt like this could be a good catch. I got in the boat to land the fish, and after an exhausting 30-minute fight, I could see the beautiful golden colour typical of a Tzaneen mirror carp. 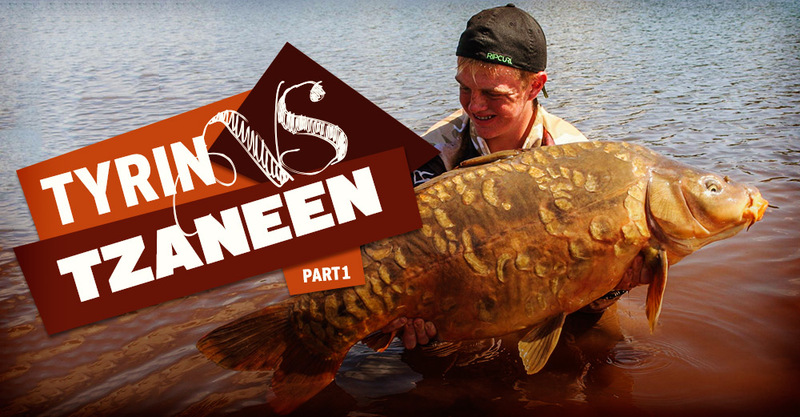 I was over the moon – I landed my first mirror from Tzaneen! Greg was on the bank waiting for me, and we were both amazed with this specimen; a stunning fish! My catch weighted 36lbs (16.2kg) – a new personal best mirror. It was time to take the good old traditional ‘bucket’ swim – a proud moment for me! I re-baited and dropped my line again, and this time it went quiet for a while. Nights were getting very cold in contrast with the heat during the day. We realised that a cold front was about to hit that Friday, and at that stage we knew we were in for difficult fishing. Tuesday morning at 6am my middle rod took off. Greg had to grab my rod as the zip on my bivvy got stuck – a typical problem for hastily anglers! We jumped into the boat and went out to land a stunning 22lb (10kg) common carp. The rest of the day grew incredibly hot – almost unbearable – and we spent most of the day in the shade thinking of tactics. We saw less action on the surface, and with the cold front we presumed the fish would be in deeper water, searching for a more stable temperature. We changed our strategy by moving our lines into slightly deeper water. Wednesday morning, my friend Greg had to pack up to go home, and it turned out to be another blazing hot day. The heat was so intense that it melted one of my plastic spice bottles, and my lighter blew up. At 5pm that afternoon oom Ferdie had a belting run on a rod he left in one-metre shallows on plain tiger nuts. This fish was big and he couldn't turn it, eventually snapping his 45lb Kryston hooklink. Oom Ferdie was shattered and it was also our last run of the session. Unfortunately, our week-long session ended much quicker than anticipated. It wasn't easy with the cold front hitting us from out of the blue, but I had learned a hell of a lot. I came to the conclusion that patience, adequate preparation and feature finding are all vitally important to a successful session! Perhaps with less disturbance on the water, and less feed going in, we might have had a different outcome. For the upcoming competition that was just around the corner, I simply needed to be more vigilant in my tactics and hope the weather plays along. Keep on eye on CarpFever’s website for Tyrin’s follow up article about his experience at the SA Trophy Carp Angling finals!